Dan was born on November 10, 1954 in Indianapolis, Indiana. Most of his childhood was spent in Indiana, although he lived for a few years in Michigan. Dan’s financial career began when he was 10 years old. He earned his first dollars as a junior gardener (mowed many lawns), delivered newspapers, and worked as a busboy in a Chinese restaurant. A Co-Op training program in high school led to jobs at Sears Automotive and the Cornelius Printing Company. He joined the Marine Corps immediately after high school. His 25-year career with the Marine Corps spanned from boot camp, where he trained as an infantryman, to his promotion to Major in 1995. He retired from the Marine Corps with high honors in 1998. Dan was blessed by the educational opportunities afforded by the Marine Corps. He began college in 1976, with an emphasis in business. In 1979, the doors opened for his transfer from infantryman to accounting. He received his Bachelor of Science degree from San Diego State University in 1987, while stationed at the Marine Corps Recruit Depot in San Diego. He transferred to Hawaii in 1990, where he completed his Masters of Business Administration at Hawaii Pacific University. The Lord touched Dan’s life at an early age, thanks to a determined grandmother who was the wife of a Pentecostal Pastor. He remembers the day she took him to church to be baptized in an indoor baptismal pool. He was not, however, taught the Word of God and lacked a relationship with the Lord. He attended the Horizon Christian Fellowship, a Calvary Chapel ministry in San Diego, and received Jesus as his Lord and Savior in October 1986. Calvary Chapel Honolulu became his church home while he was stationed in Hawaii from 1990 – 1994. Dan began to grow closer to the Lord through a weekly home fellowship and Bible studies, and by serving regularly at church. Dan was transferred from balmy Honolulu to Camp Pendleton in 1994, and joined the Calvary Chapel of Oceanside (CCO) family. He had a deep desire to serve the Lord, and became a Deacon in 1995. He completed the CCO Internship Program in 1997. He was mentored by Senior Pastor Ralph Wood through the Joshua Program, which prepares those who feel called by the Lord to become pastors. 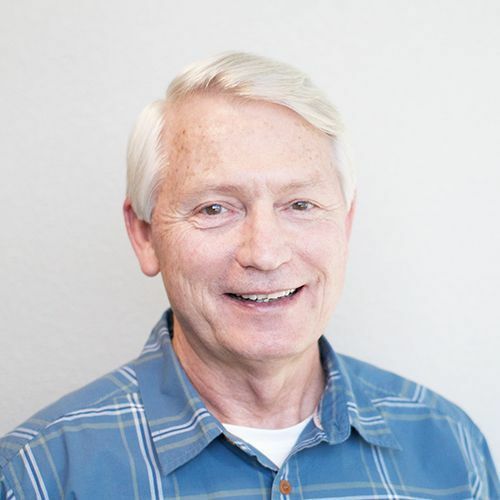 Dan joined the CCO staff in 1998 as an Assisting Pastor in charge of Administration. His duties were changed in 2001 to finance and accounting. Dan is married to Cindy and has a son, Matthew. He also has an adult son, Michael, from a previous marriage.